Dragon Age 2: I just can’t stop posting! Every time I find out something more about Dragon Age 2, I recoil in horror, and yet, like a moth bashing against a lightbulb, I just can’t tear myself from it. First, there was an underwhelming behind the scenes video of Dragon Age 2 being made, complete with fairly pre-alpha looking combat and a programmer talking about enemy archetypes. What you don’t listen to is the loud internet commentary. The loudest voice is probably not the one you listen to. You listen to the person who put a lot of thought into it, who went out of their way to provide feedback. We’re starting public testing for Star Wars: The Old Republic, and the fans are encouraged to write up their perspectives in the private forums. You’re not allowed to break NDAs (non-disclosure agreements) – if they want to talk, they can talk all the want in their official, appropriate area. It’s interesting to read, and the insights of the fans are valuable. I think there’s a sort of thuggish mentality of the crowd on the internet, with people jumping on board. I think it would be very rare that you would find valuable things in the comments section of anything. Occasionally there’s stuff, but we’re not swayed by it. You can really be reactive to that. We tend to be very analytic, we put it down and move it around until we actually understand it. But I think one of the ways we make great games is by being really, really open to criticism. I’m really not sure what he’s saying there, but it seems that they feel the people who are complaining are wrong, basically. I guess they only want to be open to the criticism that the previous game received (provided they agree with it?) – mainly, I assume, from people who got a headache reading more than 15 words at a time. 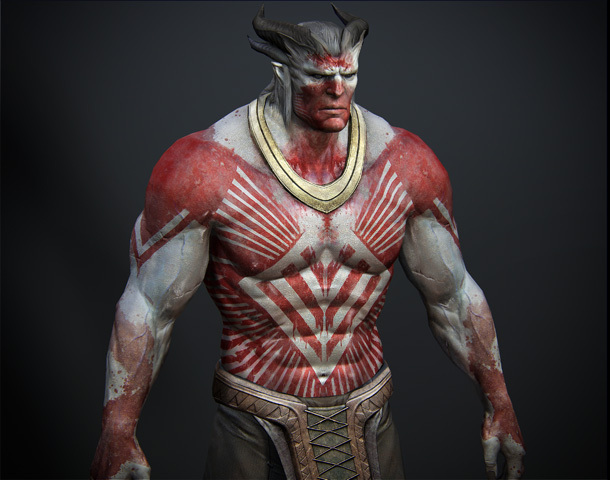 Anyway, the week continued with pictures of the (hot rodded) redesigned Qunari. I have to take a step back here, because I actually don’t mind the redesign at all. I didn’t realize that the Qunari were really meant to be anything more than just dark, burly dudes in Dragon Age 1, and when the whole brood mother thing happened, I was pretty perpexed by the whole “black people => ogres” deal, but I assumed it was just some kind of subconscious racial “thing” on the part of the writers/designers. So alright, if it doesn’t bother me, why am I mentioning it? Because, while the redesign doesn’t annoy me, the retconning does. Not all qunari have horns. Some are born without them, but it has never been considered a defect. Instead the mark is considered special, indicating one who is clearly meant for a special role in their society—as a Ben-Hassrath who enforces religious law or as an envoy to other races. It is also not uncommon for qunari who abandon their beliefs to remove their own horns, for reasons not yet clear. Needs more update man. There are new blade runner … I mean deus ex 3 screens out. i don’t see what the big deal is, obviously the design of the game is based on the art directors final say. I love dragon age and surely this will be a great game. There are so many fans that are excited for DA2 that the minor flaws will be overshadowed, just like in DAO.